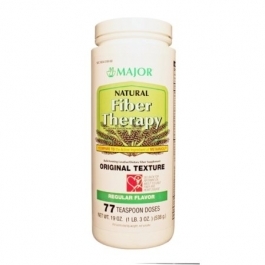 When you need more fiber in your diet, turn to Major Natural Fiber Powder. The 100% natural fiber formula helps support digestive health and aids in achieving a regular elimination cycle. Health experts agree that dietary fiber is not only essential for digestive health, but can contribute to maintaining a healthy weight and lowering your risk of diabetes and heart disease. This original natural fiber supplement delivers a potent serving of psyllium fiber for natural and predictable elimination. The Major Natural Fiber Powder is an effective and safe way to increase your daily fiber intake and relieve constipation. Put 1 dose into an empty glass, fill glass with 8 oz of water or favorite beverage, stir briskly and drink promptly. CHOKING HAZARD: Taking this product without adequate fluid may cause it to swell and block your throat or esophagus and may cause choking. Do not take this product if you have difficulty in swallowing. If you experience chest pain, vomiting, or difficulty in swallowing or breathing after this product, seek immediate medical attention. Each rounded teaspoonful contains 6 grams of 100% natural psyllium hydrophilic muciloid, equal to 3 grams of soluble fiber.